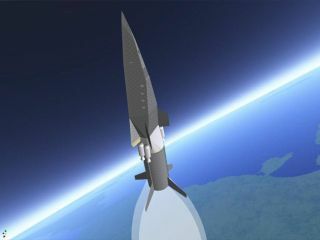 An artist's interpretation suborbital rocket launches the PlanetSpace Silver Dart vehicle. Even as theprivate spaceflight firm PlanetSpace,Inc. aims for orbital space shots, the Chicago-based company is alsodrawing up plans for a suborbital Earthtransit system. The firm'splanned SilverDart space plane, currently targeted at providing NASA crew and cargoservices to the InternationalSpace Station (ISS), could be equipped with a suborbital rocket engine forpoint-to-point flights on the Earth, PlanetSpace CEO Geoff Sheerin told SPACE.com[image]. "This isthe killer application for space industry," Sheerin said. "You've got a destinationalready." PlanetSpaceofficials are planning to make their first Silver Dart demonstration launch byDecember 2009 [image]. "The initialtests of that Dart are suborbital," Sheerin said. "We're talking about an initialtest flight that might go 5,000 miles (8,046 kilometers) down range, sowith the Dart you can glide quite a ways." PlanetSpace'sSilver Dart spacecraft calls for a metal lifting body frame based on the U.S.Air Force's Flight Dynamics Laboratory-7 (FDL-7) and NASA's X-24B test aircraft.The spacecraft is designed to fly at hypersonic speeds of up to Mach 22, launchatop either an orbital NOVA booster [image]or suborbital rocket, and make a runaway landing [image]. PlanetSpace'splanned suborbital Silver Dart booster is reminiscent of NASA's Little Joe rocketused during tests of the space agency's Mercuryspacecraft launch escape system [image]. It's theSilver Dart's potential glide range, more than 25,000 miles (40,233 kilometers)at hypersonic speeds, which lend it to point-to-point flights around Earth,Sheerin said. "A flight fromNew York to Paris in 20 minutes is not out of the question using that system,"Sheerin said, adding that it is the longer, 16-hour flights where Silver Dartcould excel. "The best uses for this vehicle are places where it might take ajet a long haul." Sheerinsaid PlanetSpace is studying plans for an initial five-vehicle fleet of SilverDart spacecraft, each capable of making eight-passenger or unmanned cargo tripsinto suborbital or orbital space. Versatility, he added, is the goal. "If they'renot flying to orbit, then I'd like to fly them point-to-point and if they're notflying point-to-point than I'd like to be flying them on short jaunts intospace on space tourist flights," Sheerin said. "They're flight rate will bevery high." PlanetSpaceplans to launch spacecraft from Cape Bretonin Nova Scotia [image],and also has an agreement with NASA's Marshall Space Flight Center fortechnical support in spacecraft and booster development. Earlierthis month, NASA announced plans to supportPlanetSpace's orbital space plane efforts by supplying specifications andadvice, but no funding, for potential crew and cargo transport services to andfrom the ISS once the agency's shuttle fleet is retired in 2010. The U.S.space agency also agreed to similar deal with Reston, Virginia's TransformationalSpace (t/Space), while two other firms - Oklahoma's RocketplaneKistler and California-based SpaceExploration Technologies (SpaceX) - are sharing the space agency's initial $500 millionCommercial Orbital Transportation System (COTS) investment. "We don'thave any agreements with them to do demonstrations to the space station," Alan Lindenmoyer,manager of NASA's Commercial Crew and Cargo Program Office at the Johnson SpaceCenter, told SPACE.com of the COTS contenders and other firms. Asubsequent COTS bid for ISS services will be open to all capable parties,Lindenmoyer added. "Our beliefis that once we're able to satisfy NASA's requirements for going to the InternationalSpace Station, then all the other requirements for passengers and crew wouldalso be satisfied," Sheerin said.